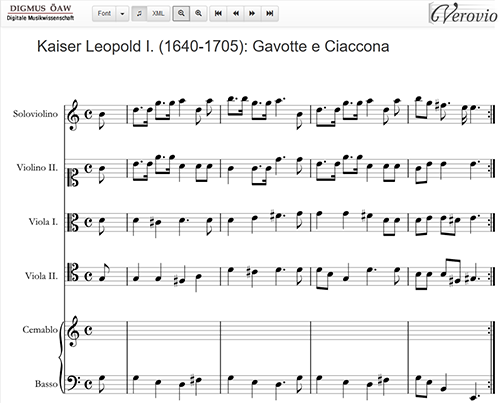 As the pilot project of digital music editing at the ÖAW, digital-musicology presents a range of sample editions. The project aims to apply the new and partly still experimental methods of digitally storing and editing musical no­tation in scholarly practice. The coding technique of the Music Encoding Initiative (MEI) can be regarded as the standard in this field. Nevertheless, the MEI schema is still in the process of development. The rendering of the MEI-coded notation is a significant challenge. Today, rendering tools such as Verovio are able to produce satisfactory results. The quality of the music graphics created on screen is comparable to the printed image of professional music notation programmes, even though the range of characters and func­tions are still limited at present.